Originating as Dirge Eternal in 2008, this symphonic heavy metal band developed inspiration from horror movies to base their lyrical content around. Certain member changes dramatically increased the stage show- adding actors to make things a ‘horror metal’ spectacular. They’ve also modified their name to Silver Bullet – releasing their debut album Screamworks in 2016 on 7Hard Records, and now signing with Reaper Entertainment for the follow-up Mooncult. Given this scribe’s first exposure to the band, these Finns intertwine a cultural thematic aspect to their hooks and riffs, while adding in the choirs and supplementary bells and whistles to keep things majestic and bombastic yet metal all the same. The quintet possesses two distinct voices – Nils Nordling handling much of the clean, melodic passages while guitarist/keyboardist Hannes Horma resides in that gritty, bard-like template. When the band choose to ramp up the proceedings speed-wise, they make sure to deliver the riffs with a passionate ferocity that almost resonates in a Grave Digger meets Megadeth manner – check out the “Holy War”-ish drive to the main hook of “She Holds the Greatest Promise” as the double bass pummels and the rhythm guitars provide the power surge. The mixing of straightforward material with songs that elaborate instrumental sections for dramatic atmosphere tension keeps the listener heavily engaged, as “Light the Lanterns (Scavengers of Death)” provides that calm to dark mystery cut necessary as a transition moment for the album, something one would expect with 90’s-era Iced Earth and a little bit of Messiah Marcolin-period Memento Mori. The choice of exotic accents for choirs and guitar/keyboard sections to come together sets up the main movements for songs like “The Witches Hammer” and “Eternity in Hell” brilliantly – controlled bombast for harmony and melody melding. Hannes and Nils as vocalists spread out the wealth to keep your interest, often trading off depending on the forcefulness or smooth nature of a verse/chorus. Silver Bullet also make sure to not overload the front half with the speedier fare – keeping “Battle of Shadows” and “Lady of Lies” as two gallop-oriented, dramatic tracks to conclude the record. 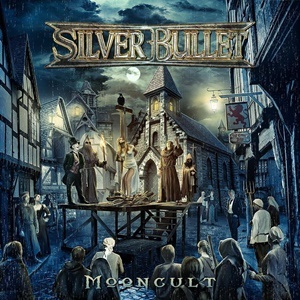 Couple this with a cover theme that matches the aural experience and it’s easy to tell why Silver Bullet can gain some appeal in the traditional and power metal fields beyond their symphonic ties. This could be that hidden gem of 2019 for you and makes me want to seek out their previous Screamworks debut for sure.